Volvo VP calls V8's "dinosaurs" and claims new engines will be more powerful and fuel efficient. Bold words from company hoping to succeed against competitors that all offer both V8s and also smaller engines. This coming fall Volvo will launch its new VEA (Volvo Engine Architecture) family of engines. The new family of engines will feature modular diesel and gasoline engines for a range of Volvo products. The aim is to reduce fuel economy. Volvo will also move away from V8 engines. Diesel engines are more popular than gasoline in Europe where the tax structure favors the high compression, low revving design. Like all new things that are beneficial, the new technology must begin with either “i-“, “eco” or have an Earthy, sky theme. Volvo’s latest engine advancement is called i-ART technology. It will feature an advanced direct injection technology on diesel vehicles that monitors each individual fuel injector’s pressure. That will enable more precise fuel metering. Benefits will include lower emissions and better sound quality. Derek Crabb, Vice President Powertrain Engineering at Volvo Car Group commented in a Volvo press release today saying, " "Each injector has a small computer on top, which monitors injection pressure. 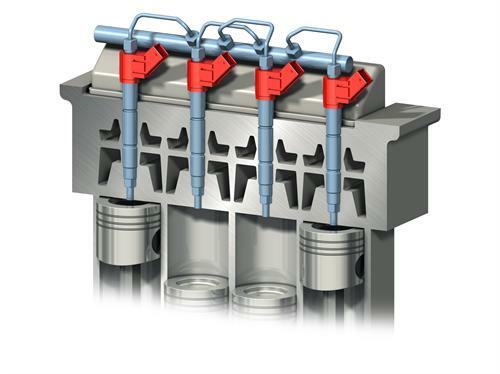 Using this information, the self-adapting i-ART system makes sure that the ideal amount of fuel is injected during each combustion cycle. Increasing the rail pressure to an exceptionally high 2,500 Bar, while adding the i-ART technology, can be described as the second step in the diesel revolution. It is a breakthrough comparable to when we invented the groundbreaking lambda sensor for the catalytic converter in 1976. It's another world-first for Volvo." In the fall Volvo will also follow almost all other automotive manufacturers and begin to ship its vehicles with primarily smaller, direct injection and turbocharger equipped gasoline engines in markets that favor that technology. Mr. Crabb went on to say with regard to this smaller, more modern engine design, "We will create smaller, more intelligent engines with so much power that they will turn V8s into dinosaurs. Our four-cylinder engines will offer higher performance than today's six-cylinder units and lower fuel consumption than the current four-cylinder generation. On top of that, electrification will bring us up into power figures in today's V8-territory." Although it is true that newer generations of four and six cylinder engines generate the power of older V8s, it is debatable whether they deliver either the fuel economy or the power of modern normally aspirated (non-turbo) engines with more cylinders. For more on that debate click here and here. It should be noted that Volvo never had its own successful family of V8 engines. Most Volvos with V8 power adopted Asian manufacturer’s engines for use in vehicles in which they were appropriate. Yamaha is the most noteworthy of the outsource partners the Chinese-owned (and previously Ford owned) company has worked with. Volvo does not presently manufacture a modern V8 with direct fuel injection or forced induction like nearly all of its competitors. Volvo will manufacture the new, smaller engines in Skovde Sweden. In addition to following the trend towards smaller, turbocharged engines, Volvo will introduce a new 8-speed automatic transmission and will use some electric assist (hybrid) technology, though details were not made available.